A few piece of cotton pads and a dried baby wipes sheet. The L'Oreal White Perfect Toner and The L'Oreal White Perfect Night Cream. For tools you need a plastic spoon and a bowl. 1. Firstly, take a spoon fool of the L'Oreal Night Cream. The night cream have good concentration of all the whitening and rosy finish ingredient! 2. 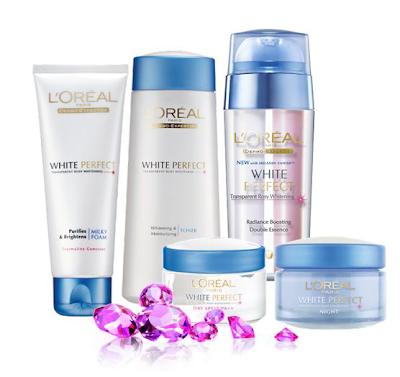 Secondly, use the L'Oreal White Perfect Toner to make it watery and dilute together. This toner also have lots of whitening effect ingredient and it have this cooling sensation too! Perfect for a calm night mask. 3. Mix Mix Mix! Its ok if it does not really mixed up together. 4. Take your cotton pad and spread it on like spreading a butter on a toast! 5. What left, soak the dried cotton sheet in. 6. Use it! Leave it for 10-15 minutes and then don't rinse it off! Just massage whats left and you are good to go! Best use in the night. Don't forget to check out Ms Rosy tips and tricks and you can also win the L'Oreal skincare set by just posting a photo! All details are in links below! Who is Miss Rosy? You can check out my post here (link) to find out more! wah, i never thought we can do this mask! definitely will give it a try ^_^ thanks for the share sab! hehe, glad this help you! try it ok! welcome syg! such a nice dye! your blog is very lovely and interesting. im glad if you visit my blog, too <3 keep in touch! Thank you! you have an awesome blog! I was wondering how this skincare products are working with you. I just read your post on "How to Choose the Right Skincare Product For your.." and you mentioned these products. So you basically been using them for about a month right? I just finished my skincare products from TheFaceShop and was wondering if I should go for this line as we basically have the same issues, especially the hyper-pigmentation part. Sigh. Thanks dear! so far so good actually, my favorite would be the toner and the night cream. for pigmentation, i think it takes a lot of time to reduce. welcome!